“Following the advice given in your survey report in June 2017, we opted to solve the heating problem in the theatre caused by our use of high-energy stage lighting fixtures by installing LED lamps. Although the total cost of the project was £40K, this will hopefully be amortised over at least 20 years and this, in combination with an energy saving of at least 70% on a typical show, represents a win, win result. The fact that we saving energy by this means was attractive to funders and we were assisted by, in addition to private donors and our resident theatre company, The Elmley Foundation, Worcestershire County Council, Malvern Town Council and Severn Wye Energy. We deliver AIEMA qualification courses and IEMA foundation courses on behalf of Astutis. These have included open courses and closed, company-based courses. Julia is an ISO 14001 and ISO 50001 auditor with BSI, a UKAS-accredited certification body. “Julia undertook a 3-year strategic review at my company. I cannot recommend her highly enough – without doubt the best auditor we have ever had. She explained the audit process clearly and concisely to everyone she spoke to and made staff who are nervous of auditors at ease and as a result questions were answered openly and honestly. Issues raised were valid and clearly explained to the management team in plain, no-nonsense language so that the actions required were clearly understood. The report was well written, detailed and was well received by the management team. 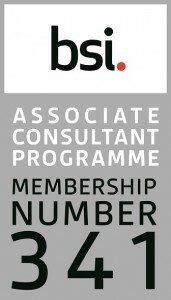 Quest is also an approved consultant in BSI’s Associate Consultant Programme. Copyright © 2018 Quest Future New Solutions Ltd. Registered in England & Wales. Company no. 7115281. Registered address: Quest House, 27 Upper Chase Rd, Malvern WR14 2BT.